University of California Press, 9780520215962, 260pp. The ancient Greeks were for the most part a rural, not an urban, society. And for much of the Classical period, war was more common than peace. Almost all accounts of ancient history assume that farming and fighting were critical events in the lives of the citizenry. Yet never before have we had a comprehensive modern study of the relationship between agriculture and warfare in the Greek world. 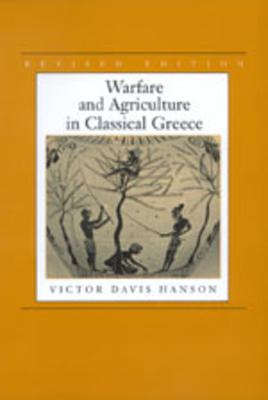 In this completely revised edition of Warfare and Agriculture in Classical Greece, Victor Davis Hanson provides a systematic review of Greek agriculture and warfare and describes the relationship between these two important aspects of life in ancient communities. With careful attention to agronomic as well as military details, this well-written, thoroughly researched study reveals the remarkable resilience of those farmland communities. In the past, scholars have assumed that the agricultural infrastructure of ancient society was often ruined by attack, as, for example, Athens was relegated to poverty in the aftermath of the Persian and later Peloponnesian invasions. Hanson's study shows, however, that in reality attacks on agriculture rarely resulted in famines or permanent agrarian depression. Trees and vines are hard to destroy, and grainfields are only briefly vulnerable to torching. In addition, ancient armies were rather inefficient systematic ravagers and instead used other tactics, such as occupying their enemies' farms to incite infantry battle. Warfare and Agriculture in Classical Greece suggests that for all ancient societies, rural depression and desolation came about from more subtle phenomena—taxes, changes in political and social structure, and new cultural values—rather than from destructive warfare. Victor Davis Hanson is Professor of Classics at California State University, Fresno, and author of The Western Way of War: Infantry Battle in Classical Greece (1986), The Other Greeks: The Family Farm and the Agrarian Roots of Western Civilization (1995), and Fields Without Dreams: Defending the Agrarian Idea (1996).